Antiseptic, toning and stimulating . 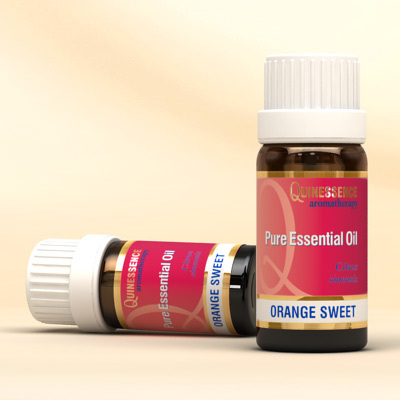 Sweet Orange Essential Oil is the perfect mood-enhancing oil, energizing, soothing and uplifting the mind and body. A few drops added to a diffuser lifts the mood of everyone it touches, and helps calm tantrums and frustration with children and adults! The familiar fresh, sweet and fruity aroma purifies the air, stimulates creativity, and never fails to create a joyful, warm and sunny atmosphere everywhere it is used. The cleansing, purifying and toning properties of Sweet Orange Essential Oil are perfect for blending with other lymphatic stimulant essential oils in massage blends to treat cellulite, or as part of a natural detoxification program. It is a tonic to the muscular and nervous systems, and when massaged on the abdomen it stimulates poor digestion, eases stomach cramps, and gives a healthy boost to the immune system. The stimulating and toning properties of Sweet Orange Essential Oil are also valuable in skin care blends, where it stimulates the micro-circulation of blood, encouraging renewal and bringing life back to a dull complexion or balancing oily skin. The antiseptic properties of orange oil can help keep invading bacteria at bay wherever it is used.